QUICK 5 MINUTE WALK TO BEAUTIFUL WHITE SAND BEACH! Now, you can enjoy this luxurious home on Marco Island with a 16,000 sq ft 0.37 acre lot size which offers the best in both privacy and location. Enjoy the magnificent long, wide water views from many locations, the dining room, the kitchen, the family room, the patio and especially outside in your own private heated swimming pool. The electric heated pool can be accessed through two sliding patio doors. Both the pool and screened lanai have a southern eastern and western exposure allowing you to take full advantage of the outdoor living from the warm Florida sun. 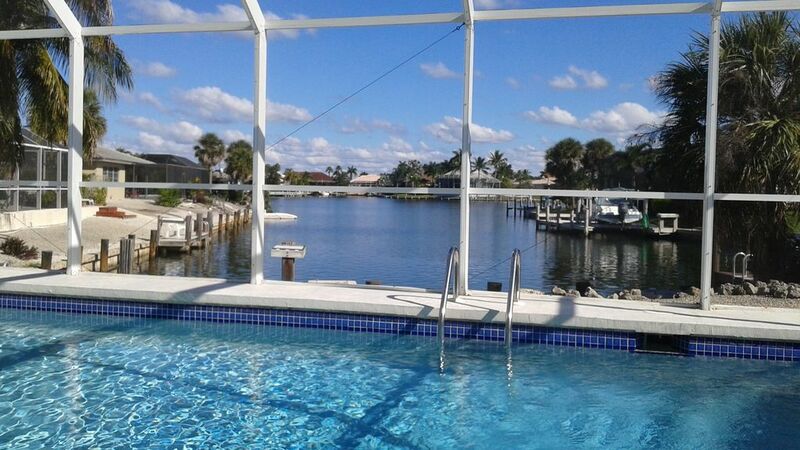 Just steps from the pool you can catch fish right off your own private boat dock! With its access to the Gulf of Mexico, you can be enjoying the clear beautiful waters of the Gulf in minutes!! or boat on over to a great restaurant and have dinner. All this can be done right from your own back yard! Take a peace full five minute walk down Maple Ave to surround yourself in the gorgeous crescent white sand beaches of Marco Island. The Island is well known for it's shelling. On the inside, the house has recently been updated with beautiful tile flooring throughout the house and carpet in the bedrooms. A new oven, cook top, microwave, Refrigerator, washer and dryer have also been added. Ceiling fans are in all bedrooms and family room for those warm Florida nights. A separate living room, family room, and kitchen gives the family more than enough places to congregate. Marco Island is six miles long and four miles wide. You'll never have to leave the Island, however, there is so much to see near and around Marco. Marco is the largest of the 'Ten Thousand Islands.' You will find that Marco Island is its own self-sufficient entity. With 18-hole golf courses in and around the Island, as well as over 50 locally owned and operated restaurants. All with the great food you can imagine. Activities offered in the area range from paddle boats, jet skiing, power and sail boats, charters, parasailing, biking, and shopping. You can watch Eagles fly, Dolphins play, or just enjoy spectacular sunsets along miles of white sand beaches. All this and more will surround you on, Marco Island's Tropical Paradise. IF YOU COME HERE ONCE... YOU'LL BE BACK TWICE!! We maintains a smoke and pet free environment. Three car driveway with attached two car garage. Quick two block 5 min WALK TO THE BEACH - Check-in time is after 4:00 PM and check-out time is before 10:00 AM. - No security deposit required; damage protection covers everything. - No additional fee for heated pool - - No need to worry about hidden costs. - No excessive noise (city ordinance). Keep loud noise on the lanai to a minimum after 10pm. 2 blocks to Public Beach Access: When close beach access is your idea of the perfect vacation, this is the property you're looking for! Step out the door with your provided wagon equipped with beach towels and cooler and head straight out the door down Maple Ave. sidewalk that will take you straight to S. Collier Blvd. After crossing Collier Blvd, you'll see the beautiful paved beach access lined with Palm trees and you're there! 5 minutes if you walk slow! The beautifully renovated Marriott Spa Resort is next to the Madeira where you can easily enjoy a relaxing massage, an elegant dinner, or just a refreshing cocktail ocean side. Many properties boast close access to the beach, so please take the time to research the exact location of the rental properties you look at. This property is where you want to be when that endless white sand is what you've been waiting for!